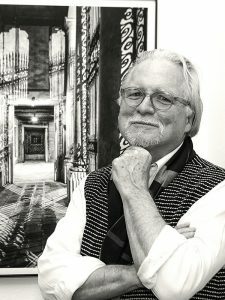 James B. Abbott arrived in Philadelphia in 1981 and began photographing the Ben Franklin Bridge and surrounding neighborhoods along the Delaware River. Over a 25-year period produced three additional and different bodies of work on the Ben Franklin Bridge and its neighborhood. He also went on to other long-term urban and landscape projects in Berlin, the Cape Cod National Seashore, Florence, and Venice. A graduate of Cranbrook Academy of Art in Bloomfield Hills, MI, Abbott has received numerous grants, awards, residencies, and commissions while maintaining a freelance photography practice. After five years of teaching in Certaldo, Italy, he has recently refocused his image-making to Philadelphia and the riverfront, and his studio at Cherry Street Pier places him in its epicenter. He will again seek to create photographs that are densely layered, idiosyncratic, personal visual interpretations that inform collective memory through investigating dichotomies and juxtapositions of old and new, iconic and mundane, enduring and changing.